Ships tomorrow if you order in the next 23 hours 21 minutes. 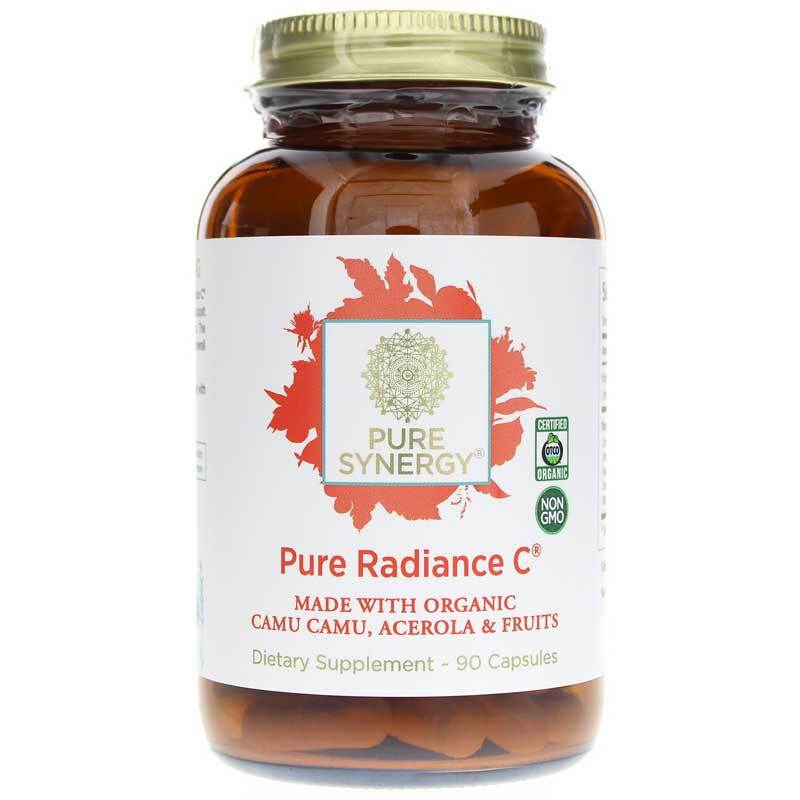 Pure Radiance C by Pure Synergy is designed with organic and wild berries - which contain vitamin C to support immune system health. 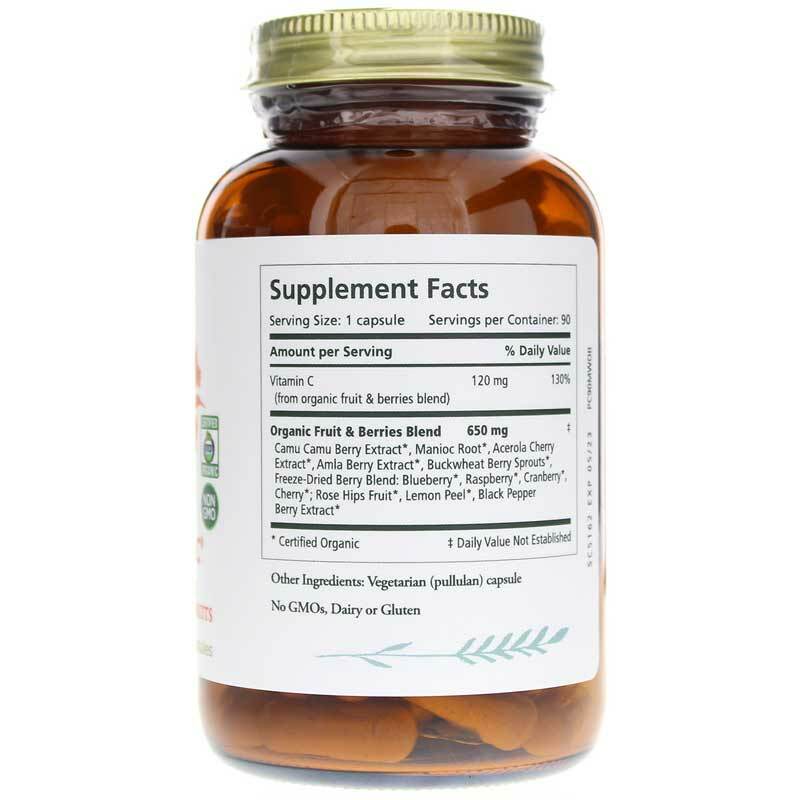 This supplement will absorb quickly into the body and naturally transport essential nutrients around the body. It does not contain any fillers or additives. What Are the Benefits of Pure Radiance Vitamin C? What are the features of the organic berries? Power up your immune system today with a pure form of vitamin C! ---Freeze-dried berry blend: Blueberry*, Raspberry*, Cranberry*, Cherry*; Rose Hips Fruit* Lemon Peel*; Black Pepper Berry extract. Contains NO: additives, fillers, GMOs, gluten or dairy. Adults: Take 1 capsule 3 times a day for optimal health maintenance; more may be safely consumed when additional immune support is desired. I like Pure Synergy supplements and this natural Vitamin C is no exception. Pretty good price too compared to similar products. Love that NHC carries this line. Higest Quality Vit. C ! I used to take other cheap vit. c powders and just did not get results. 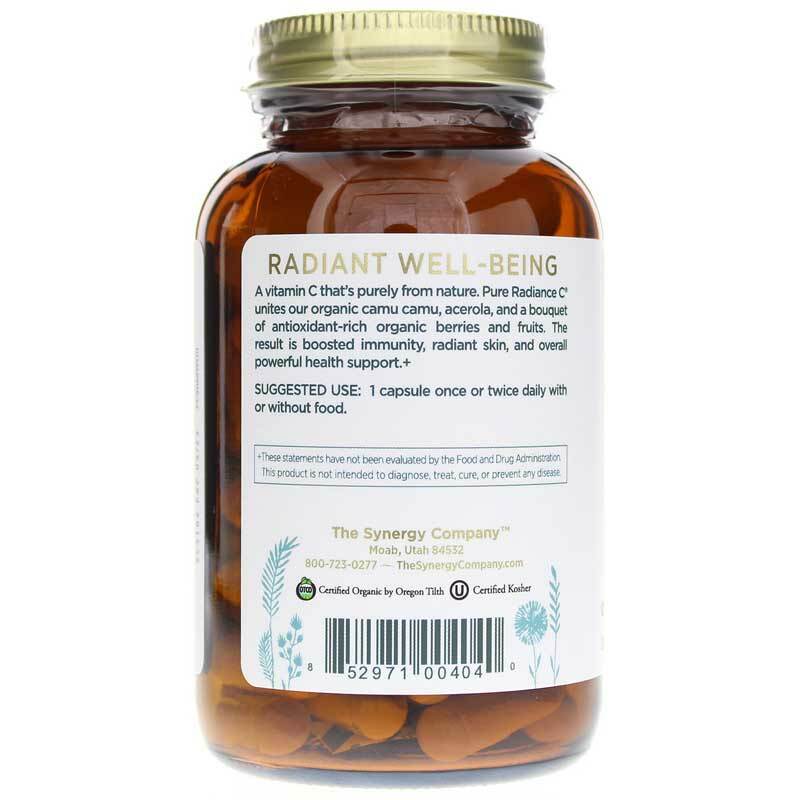 Then I started taking Pure Radiance and find that I feel better and do not get sick like others do! Thank you Pure Radiance !! Pure Radiance C is a great whole food. There isn't another VIt. C that can even compare...the quality and purity is the best. I will never take a synthetic ascorbic acid or Ester C again. This product really made me feel the diffrents over synthetic C I was taking.I feel it absorb very quicky with no allergy! I do wish they made the capsule w/ higher then 120mg.Over all, Pure Radiance C is a great product. Love Pure Radiance C by Pure Synergy! Pure Radiance C is a great natural product with all natural ingredients. Love the natural food sourced C.
I had night cramps in my legs. Since I changed my diet to what is now near perfect (no grains/concentrated carbs, healthy fats, fermented foods, bone broth, organ meats, organic everything), the cramps diminished but would not go away. If I stretched or turned over and slept on one side too long, I could get one. My naturopath suggested natural Vitamin C and I was using a chewable brand which was a combo of synthetic w some acerola added. It helped a little. Now that I have found Pure Radiance, the cramps are gone. Finally relief after years of interrupted sleep! I don't have to worry about getting up too fast or sleeping in one position too long. It has to be this C because nothing else in my diet has changed. It seems the body needs the whole food. After I started taking this Vitamin C along with zinc I have not gotten sick once. If I stop taking it within a week or two I feel run down and a cold coming on. It is an absolute must for me! I used to get sick about once a month or so for years. I love that this is from food and not synthetic! Made from berries, very good. Love it, natural and it gives me lot of energy! Great price for Vitamin C! It is said this is the BEST Vit C on the planet! Great price, even better with coupons that came after I ordered 1st time with Natural Healthy. So glad in the cap form, less shakes, drinks I have to take. I was told also to take Rich's MSM with this for max benefits. WHOLE food Vit C. I take x2 a day. Best C vitamin, my doctor said it's the best!